STEEL PANTHER have just announced a series of "Threesomes". The glamorous rock n' rollers will be playing two three-night residencies, one in their hometown of Los Angeles and the other in nearby Las Vegas, at the cities' respective House Of Blues venues. The shows will be spread out through the month of February. 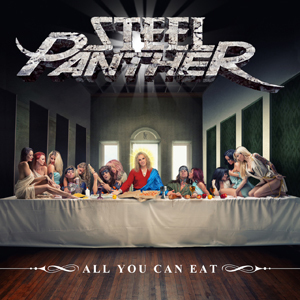 STEEL PANTHER holds the record for a Los Angeles residency, playing for more than ten years. Please see below for the most up-to-date list of 2014/2015 North American tour dates, including a two-night stint in Vancouver in January, 2015. STEEL PANTHER is currently bringing their raucous show to North American audiences on tour as main support for iconic metallers JUDAS PRIEST. The band's opening set has been winning praise from critics and fans alike. Immediately following the JUDAS PRIEST tour, STEEL PANTHER will make a quick jaunt to Japan for two shows and will then return to the United States to begin their December headlining run, rounding off a very hectic, successful year. Check out their latest video for "Pussywhipped" HERE.